Washington needs to realize that bringing Erdogan’s hostage diplomacy to an end will require the synchronized targeting of Erdogan’s cronies. Targeting Erdogan’s cronies would likely receive support from Turkish citizens, who have little love lost for the country’s kleptocratic elite. To force Erdogan change course, sanctions must have a tangible economic impact. Putin knew this all too well when he imposed sanctions after Turkey downed a Russian jet on the Syria-Turkey border in 2015. More effective targeting to free all US and European hostages could finally convince Erdogan to take a U-turn from his reckless hostage-taking tactics. The Trump administration has now made good on its threat to sanction Turkey if Ankara refused to release an American pastor from custody. Washington designated Turkish officials under the Global Magnitsky Act, a 2016 law that allows the government to punish foreign individuals for corruption and human rights abuses. The sanctions against them block any of their property that rests within American jurisdiction and prohibit U.S. citizens from doing business with them. The August 1 designations of Minister of Justice Abdulhamit Gul and Minister of Interior Suleyman Soylu are the first-ever sanctions against a NATO ally. The ministers are also the highest profile officials targeted under Global Magnitsky authorities since Washington’s very first designations in December 2017. Gul and Soylu do not appear to have any assets or business interests in the United states. The sanctions, nevertheless, rattled Turkey’s political establishment. It was no good news for its faltering economy, with the currency plunging to a historical low, beyond 5 liras to the dollar and interest rates jumping to record highs. Although Berat Albayrak, in his capacity as Treasury and Finance Minister (who also happens to be Mr. Erdogan’s son-in-law), predicted that the designations will have a limited impact on the Turkish economy, additional designations of Erdogan’s cronies would hurt the Turkish strongman’s warchest. To force Erdogan change course, sanctions must have a tangible economic impact. Russian President Vladimir Putin knew this all too well when he imposed sanctions after Turkey downed a Russian jet on the Syria-Turkey border in 2015. The Kremlin insisted on a personal apology from Erdogan. It was not forthcoming. In response, Russia cancelled energy projects and banned the import of Turkish fruit and vegetables, the sale of charter holidays for Russians to Turkey and construction projects with Turkish firms in Russia. Putin’s measures put significant pressure on Turkey’s struggling economy, hitting the tourism industry particularly hard. In a speech to the Russian parliament, President Putin announced that Turkey “will regret it” and it did. After several months, Erdogan apologized for the downing of the plane and called for Russia and Turkey to mend a bilateral relationship. Germany took a page from Putin’s playbook when Turkey jailed German citizens. After Ankara arrested Turkish-German journalist Deniz Yucel, Berlin actively worked to cut funding to Turkey from German and international development banks. Turkey relies on access to foreign funds to finance its current-account deficit and German banks are the second-largest providers of lending to the Turkish private sector. The banks imposed tighter restrictions on funding. At Germany’s urging, the European Investment Bank put its Turkey projects on hold. German Chancellor Angela Merkel announced that she would seek to curtail the European Union’s pre-accession funding for Turkey and threatened not to renew Turkey’s customs union with the European Union. Germany’s hardball paid-off and Turkey released Yucel. The Global Magnitsy Act might have hit the pocketbooks of Putin and his cronies pretty hard because it targeted tens of Russian oligarchs who hold their assets overseas and similar versions of the act was implemented by several U.S. allies. This has resulted in the increasing isolation for the Russian business elite. In contrast, the current U.S. move targets only two Turkish ministers. The United States’s further response matters all the more as European countries who had their fair share of drama with Ankara are now trying to mend ties with Erdogan. The Netherlands and Turkey restored formal diplomatic ties on July 20, while the next day Berlin ended restrictions it imposed in 2017 on export guarantees for trade with Turkey. And, making nice even more, Germany announced an Erdogan state visit for late September. Washington needs to realize that bringing Erdogan’s hostage diplomacy to an end will require the synchronized targeting of Erdogan’s cronies. This move would likely receive support from Turkish citizens, who have little love lost for the country’s kleptocratic elite. More effective targeting to free all U.S. and European hostages could finally convince Erdogan to take a U-turn from his reckless hostage-taking tactics. 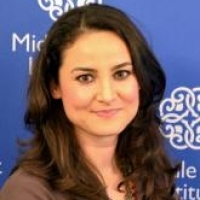 Gonul Tol is the founding director of the Middle East Institute’s Center for Turkish Studies.